A mix of 4 Star hotels, high speed trains and coach with a tour manager, driver and local guides guide as required. Enjoy an introduction to the art and culture of Southern Spain over two weeks in May 2017. 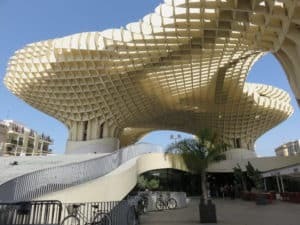 Starting in Madrid and ending in Lisbon, this tour will take in all the amazing highlights of Moorish Spain, including Seville, Granada, the Alhambra and much more. Day 2. Tuesday – 2 May Madrid . Upon arrival at Barajas Airport Madrid you will be met by your Tour Manager for the transfer to your hotel. Madrid stands in the foothills of the Sierra Guadarrama at the very centre of the Iberian Peninsula and is Europe’s highest capital. This lively city is bursting with classical and baroque buildings and is blessed with a wealth of art thanks to the collections of the Habsburg and the Bourbon royal families. Much of that artistic wealth is housed in the Prado Museum. It was Charles I, who enriched the city with palaces and monuments. Later, Philip II made it the capital of Spain and the city grew dramatically. During an orientation tour of the city we will see much of this grandeur reflected in the Renaissance and Baroque style buildings. After settling into our hotel we will have a guided orientation tour exploring the16th century Plaza Mayor, the famous Puerta del Sol, The Teatro Real, We will visit Royal Palace or ‘ el Palacio Real’, built between 1738 and 1764 and considered to be one of the finest palaces in Europe. Enjoy a welcome reception and dinner tonight at a local restaurant in Madrid. This morning focuses on two great art ‘wonders’, the Prado Museum and the Reina Sofa Museum. Our guided tour takes in the grand and recently completed Prado extension by Rafael Moneo. Located in an 18th century building designed by Juan de Villanueva, the Prado is considered one of the most important art galleries in the world housing one of the world’s most important collections of European art from the 12th -19th centuries and the world’s most important collection of Spanish paintings. It houses masterpieces by Velázquez, Goya, El Greco, Zurbarán, Ribera, Titian, Raphael, Botticelli, Fra Angélico, Rubens, Bosch, Van der Weyden, Poussin, Lorrain, Watteau, Rembrandt, Dürer and Mengs, among many others. After our visit we then will walk into the truly splendid Retiro Park ‘El Retiro’. We can have a light lunch at leisure in one of the many waterside cafes. From its grandeur you will see that the park used to be owned by Kings of Spain until the 19th century when it became a public park. We will see the stunningly beautiful Palacio de Cristal (El Palacio de Cristal) and the Palace of Velazquez. Afterwards we will visit the Thyssen-Bornemisza Museum, a short stroll from El Prado. In this beautiful light and airy modern museum this magnificent collection gives an overview of art from the 13th to the 20th century. Movements not covered in the state owned museums are covered here – Impressionism, Fauvism, German Expressionism and the avant-garde movements of the early 20th century. It also has a unique collection of 19th century American painting. The collection is a fantastic contrast to the works of El Prado. End the day with delicious tapas and drinks in a local Madrid restaurant. This morning we transfer to the Reina Sofia Museum – the National Museum for 20th century Spanish art. The collection addresses the conflicts of the time reflected in the art movements of the time -Cubism, Dada, Surrealism. Faced with the threat of Fascism in the 1930’s we see the link in art form between the avant-garde and politics , the pinnacle of this culminating in the Spanish Pavilion at the 1937 World Fair in Paris, and with the showing of Pablo Picasso’s Guernica which is now housed here. After our visit, a short walk to Atocha rail station where our train awaits. We take the high speed AVE train to the beautiful city of Cordoba in the province of Andalaucia. Settle into our hotel and enjoy evening at leisure. Overnight Cordoba. This morning enjoy a guided walking tour of the historic centre of Cordoba. Everywhere you look is a picture postcard view of whitewashed houses, tiled patios and colourful flowers spilling over balconies. We take in the Roman bridge stretching over the Guadalquivir river and the Juderia – they myriad streets of the Jewish quarter. We visit the Great Mosque, La Mezquita, built over a period of 200 years following the Moorish conquest of the area in the 8th century. This has to be one of the most unusual buildings on earth – a mosque with a 16th century Christian church poking up out of the middle of it, it covers more than 24,000 metres in area and contains over 900 slender columns. The peaceful courtyards are perfect places to sit and reflect on the history and culture of this beautiful city. After our tour we have lunch together and in the afternoon drive out of Cordoba to visit the amazing Medina Azahara. Here lie the evocative ruins of this vast, fortified Arab Muslim medieval palace-city built by Abd-ar-Rahman III al-Nasir, (912–961) , who was the Caliph of Córdoba at the time. This was the defacto capital of al-Andalus, or Muslim Spain. The palace-city included ceremonial reception halls, mosques, administrative and government offices, gardens, a mint, workshops, barracks, residences, and baths and water was supplied through aqueducts. Return to Cordoba for a free evening. This morning we drive to Granada. 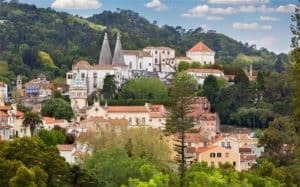 The landscape is a mix of greens whites and golds – olive trees and vineyard stretching out as far as the eye can see and dotted with small white villages topped by ruined castles. We arrive into Granada which lies in the foothills of the Sierra Nevada, snowcapped in winter they form a splendid backdrop to the city. After settling into the hotel we will have a walking tour of the centre taking in the cathedral to see the tombs of Ferdinand and Isabella. This evening we will take a walk in whitewashed Albaicin area, a UNESCO designated heritage quarter of the city and visit one of the ‘Cuevas’ to listen to Spanish guitar with tapas and wine. 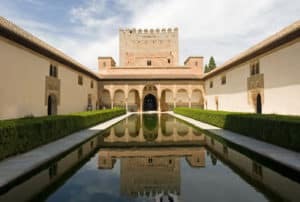 Today we have a guided tour to The Alhambra Palace. This mountain top palace, built as the centre of the Moorish kingdom of Granada, represents the pinnacle of Moorish art and architecture. We visit the wooden Royal Palace and the fortifications of the Alcazaba. The serene gardens of the Generalife, country estate of the Nasrid kings, on the Alhambra’s northern side, are a perfect place to relax and reflect on the majesty of Moorish Spain. The name Generalife means ‘garden of lofty paradise’, and the gardens have undergone many changes since the 13th Century. Today, the formal and geometric Upper Gardens are breathtaking as are is the Escalera del Agua water staircase, the Moorish patio lower gardens and the Cypress Patio, once the secret meeting place for the wife of Sultan Abu-I-Hassan and her lover. Remainder of the afternoon is at leisure to enjoy this unique setting. We enjoy a spectacular scenic journey heading to the wonderfully interesting city of Malaga set by the Mediterranean sea. The blend of architectural styles, lush gardens fringing its promenades, markets and pavement cafes juxtaposed against a sparkling sea have always made for a pleasant amble but now the city has gone up a notch with not one but two great museums which we will visit. 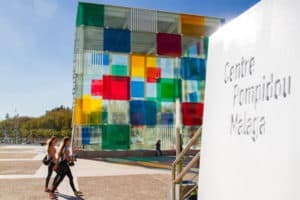 After checking into our hotel we will visit The Centre Pompidou de Malaga, housed under ‘The Cube’, which lies between the city wall and the sea. Here inside we find the permanent exhibition of works from the Impressionist collection of the Centre Pompidou Paris. Key figures are represented here including Francis Bacon, Georg Baselitz, Brancusi, Chagall, Ernst, Giacometti, Picasso, Tapies and Tinguely. Overnight in Malaga. This morning enjoy a guided tour of the historic centre of Malaga and a highlight will be a visit to the Atazanares food market, with its origins in the 14th century it is now housed in a magnificent 19th century building. Malaga was the birthplace of Pablo Picasso on 25 October 1881 and his desire was for his work to be presented here in his home city. The idea began in 1953 and came to fruition thanks to Christine and Bernard Ruiz-Picasso, the artist’s daughter-in-law and grandson whose donations form the core of the collection. Observe Picasso’s early beginnings in Malaga and how his art – presented here in all its forms – evolved to affect the entire art world. Evening at leisure in this most vibrant of Mediterranean cities. Enjoy today a most spectacular drive along the vast plains of Andalucia to the ancient bull fighting town of Ronda. We have lunch with a view of the wonderful Roman Aqueduct. Before continuing our journey to Seville. 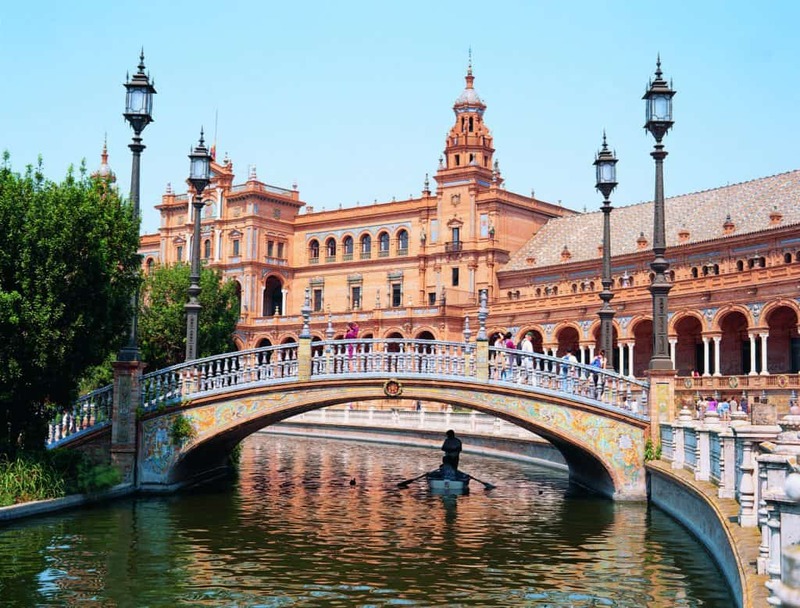 Seville is the glorious setting for Bizet’s heroine Carmen and Rossini’s Barber of Seville… This is a romantic and colourful city that you will remember forever. The discovery of America in 1492 brought new prosperity to Seville – the 15th century saw the ‘conquistadores’ setting off on their expeditions from Seville and moving across America – Nunez de Balboa discovered the Pacific in 1521, Cortes seized Mexico in the same year, Francisco Coronado explored the Colorado river in 1535, Hernando Soto took Florida in 1539, and of Chile in 1541. Seville was the bridge to this great New World and this era was known as Spain’s ‘Golden Age ‘. During this glorious era the Seville school of painters brought renown to Seville -Diego Velazquez, Zurbaran, and Murillo amongst others . Evening at leisure in Seville. This morning we have a guided tour of Seville. We focus on the Barrio de Santa Cruz, the city’s old Jewish Quarter, a beautiful warren of whitewashed alleyways and flower-lined patios, and the focus of worship for the three great religions. We visit the great Gothic Cathedral, itself built on the site of a 12th Century Mosque and the second largest cathedral in Europe after St Peter’s in Rome. The building’s architecture reflects it history – La Giralda, the bell tower is still recognizably a minaret, and the Patio de los Naranjos, with its fountains and orange trees, is unchanged from its ‘former’ life as the courtyard of the mosque. The rest of the Cathedral is florid Gothic, the incredibly rich Capilla Mayor (Chancel) with its gold leaf altarpiece, a suitably of the day at leisure. In the afternoon our guided tour takes us to the Real Alcazar (the Royal Palace), itself a Christianized Almohad fortress, where Spain’s Monarchy used to reside including Ferdinand and Isabella. See the dazzling dome of the Ambassadors’ Hall, the cool gardens and patios, and the State Rooms of Charles V.
This evening we enjoy a performance of the poetic and passionate Flamenco dance and song. Today we journey into Portugal, to its capital Lisbon, arriving early afternoon. After settling into our hotel. 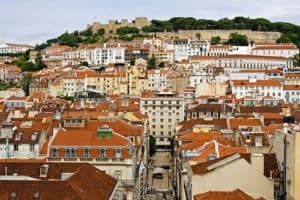 We enjoy a walking tour of the old centre of Lisbon, the ‘Baixa’ or Pombaline district and we will explore the St George’s Castle district for magnificent vistas out over the city and the sea. This morning we have a fantastic overview of this geographical wonder – the city of Lisbon is not known as Queen of the Seas for nothing and our tour takes in the truly magnificent bridges – the 25 de Abril Bridge and the Vasco da Gama Bridge We visit the 16th century Jeronimos Monastery built in florid style of architecture known as Manueline after King Manuel I. Appreciate the delicate tracery of the cloister and carved images. We visit the Belem tower with its Moorish style and distinctive battlements as well as the Monument to the Discoveries. The tower used to serve as a beacon for navigators returning along the Tagus from the Indies and the New World. Overnight Lisbon. Evening enjoy a farewell reception and farewell dinner. Sandra, of Spanish and South African origin, has travel in her soul and has a definite passion for providing amazing travel experiences with whomever she comes into contact. With a tourism degree under her belt she has been a Marketing Manager, English teacher, lived in China, Bangkok and has travelled leading groups from Asia to Africa and beyond. She has worked for many companies providing guiding and management services up until she started her own company five years ago. Sandra started her own company in Barcelona and has been providing exceptional knowledge and service to groups (including Art Tours) travelling the Iberian peninsula for the last five years. We again look forward to her insights, knowledge, skill and humility as we travel her native Spain in 2017.